Faisal was born in 1951 in El-Bireh (Ramallah, West Bank) to a Palestinian refugee family with 10 children. Originally from the village of Salamah (Jaffa), the family was displaced in the aftermath of the 1948 Nakbah. Faisal grew up in the West Bank and attended public schools through 11th grade when he came to the US to pursue further education. He received a scholarship to complete his senior high school year at George School (Newtown, PA). Faisal later attended Oberlin College and received an MBA from the University of CT.
Faisal’s professional field is employee benefits. He began his career working at the Travelers Insurance Co. and held other related positions in the service and corporate employee benefits industry. In 1979 he began publishing a magazine on employee benefits serving as editor and publisher for 13 years. In 1985, Faisal started a software company (BeneSoft, Inc.) to develop benefits administration systems for use by corporate clients. In 1998 the software company morphed into a benefits administration outsourcing firm (Aliquant Corp.) In 2010 Aliquant, which at the time served 85 major employers and employed 200 professionals, was acquired by the global HR consulting firm Willis Towers Watson. 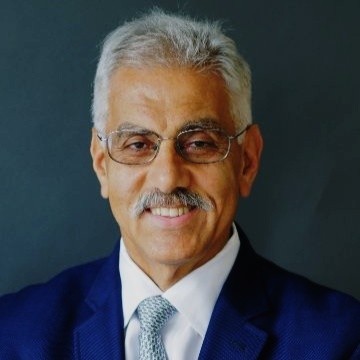 Since then, Faisal has been a half owner of the Washington DC boutique consulting firm Hager Strategic which advises major corporations on benefits and HR outsourcing strategies and vendor management. In addition to the HR field, Faisal is currently involved with businesses in real estate, Aviation, and more recently in a medical hi-tech startup, Plasmotica, that is dedicated to developing portable diagnostic devices based on advanced fluidics technology. Read a full profile of Faisal Saleh here. Desiree Omran was born in San Francisco, California to Palestinian parents who immigrated to the United States as children with their families. She grew up in the Castro district of San Francisco, where her parents owned a grocery store; she often worked alongside her parents. She earned a BS in Accounting at San Francisco State University. While attending college, Desiree worked part-time at Esprit de Corps, where she enjoyed her time in the fashion industry. Desiree is a California Certified Public Accountant. She started her career at KPMG as a tax professional, then worked for Deloitte for six and a half years. Later, Desiree joined Draper Fisher Jurvetson, serving as a controller for almost eleven years. Currently, she is the controller at Draper Management Company. Desiree served on the board of the U.S. OMEN (United States Organization for Medical and Educational Needs), a charitable organization that supports the medical and educational needs in Palestine and other Middle Eastern countries in crisis. She currently serves as Treasurer on the board of her homeowners association.